So I’m doing Picasso at the Lapin Agile at Wheaton Drama right now – big funny Steve Martin craziness, right? It’s our studio show. Now, I figured the studio show was where we do something artistically risky, just to see how the audience responds and not care too much about how it sells. This should tell you how much I still need to learn about theater… Le sigh. Silly me. Apparently, “studio show” is theater-ese for “low budget”. So, what’s a costumer to do when she finds herself with an 11 person period show, and the show budget is 500$ less than what she wanted for the costumes? Steampunk. Well, not full-on Steampunk, because that can get expensive. The basic recipe for the show goes like this: put one part Edwardian, one part Bustle-period, one part Steampunk, and 5 parts Goodwill’s Finest in a shaker with gin. Shake well. 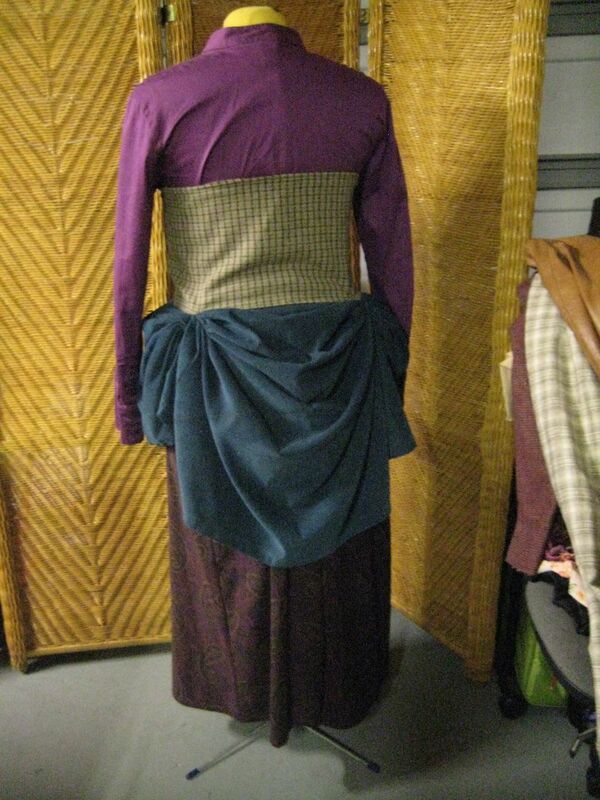 This particular costumer is for the “Female Admirer”, a character who is on stage for less than 200 seconds. Funny story – bit characters like that tend to get better costumes, because they’re off stage long enough to try oodles of stuff on. Absolutely nothing in the theater worked…. I have a festive shirt (3$) and a coordinating paisley skirt (1.50$). 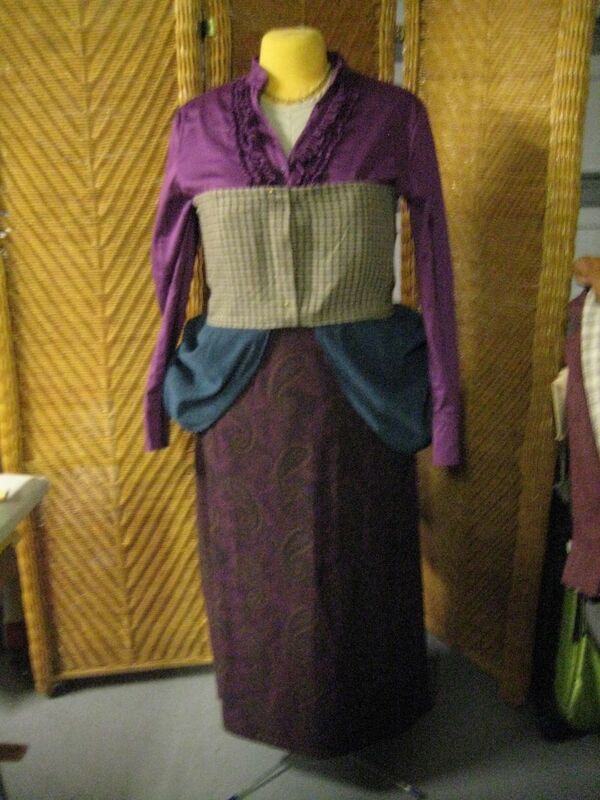 The skirt is 4 sizes too big for the actress, but that's why god made pleats. 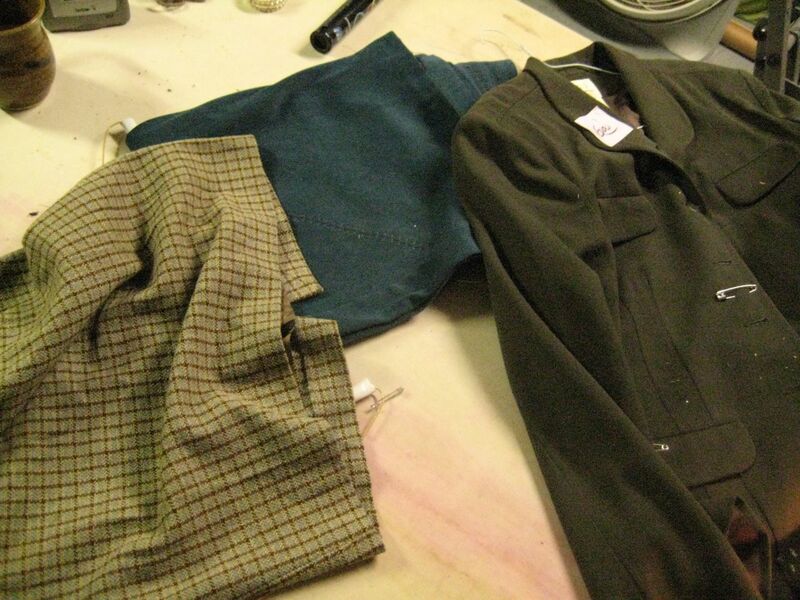 I also picked up a short plaid skirt (90c), a long teal skirt (3$), and a lovely olive wool coat (6$) that I plan to mangle. 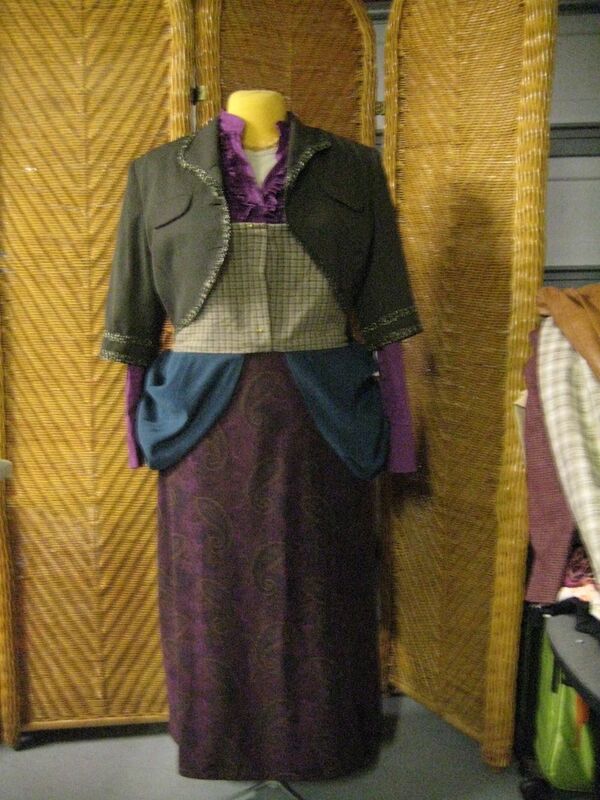 This is actually one of the most expensive costumes in the show, coming in at 14.40$. Everything else I used came out of my stash of crappita. 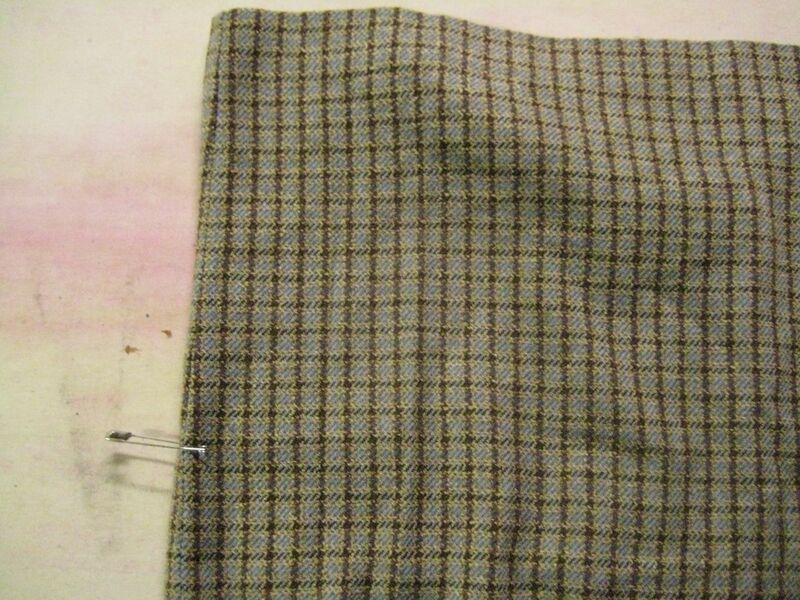 The plaid skirt is a straight knee length affair, and it’s about to become a bodice. I've marked the length I need for the bodice. 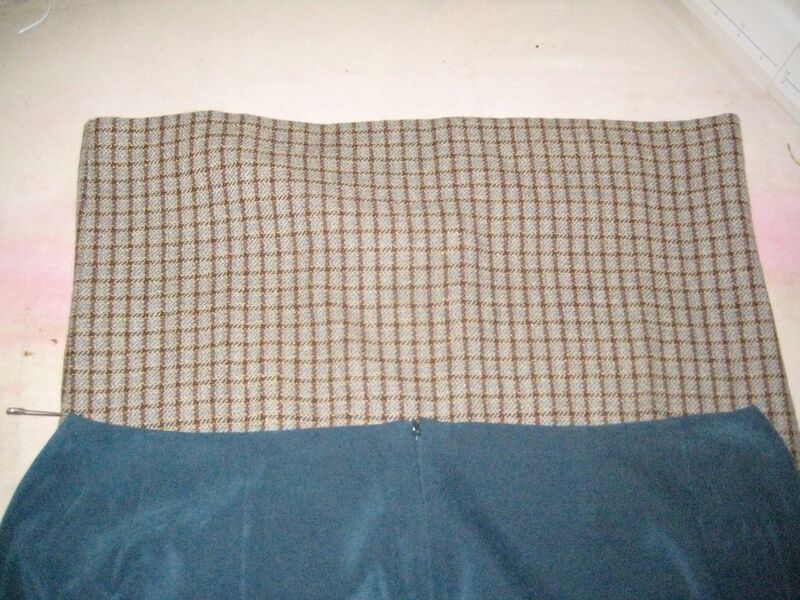 The hem of the skirt, which is already nicely finished, will become the top of the bodice. 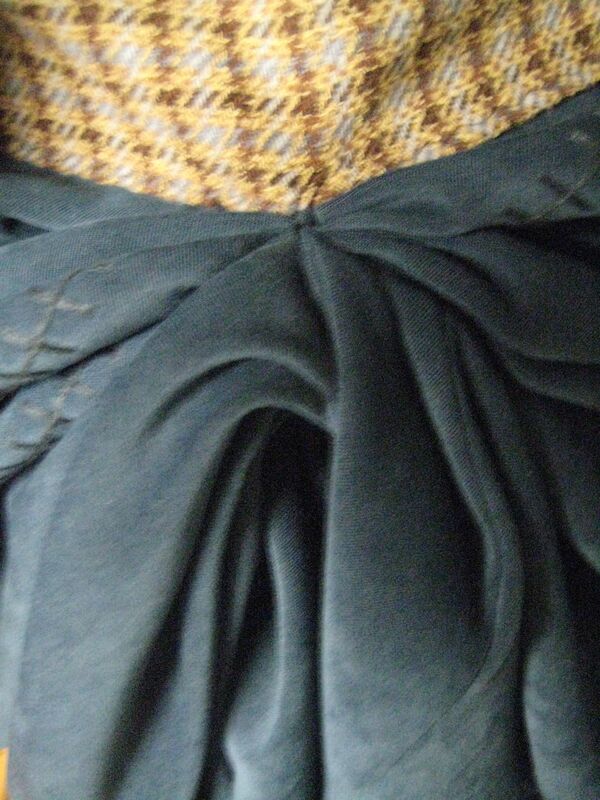 The teal skirt will become a sort of built-in bustle on this bodice. 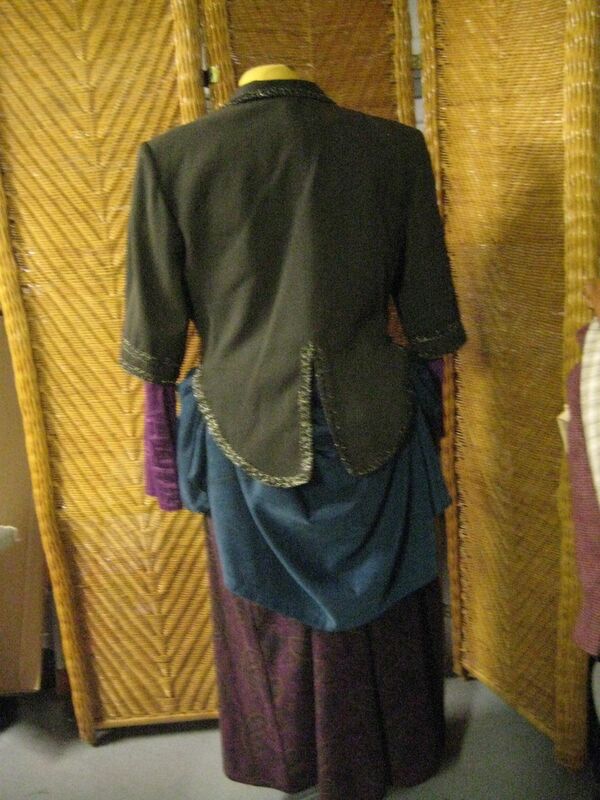 I ripped the zipper and center back seam out of the teal skirt, and sewed it to the bottom of the bodice. The back has some faux bustling. This is a closeup of my little tucksie-upsies. There's not a lot of technique here - just gather everything up in your off paw, and sew through the layers until you're sure they're not going anywhere. Try to hide the ugly. 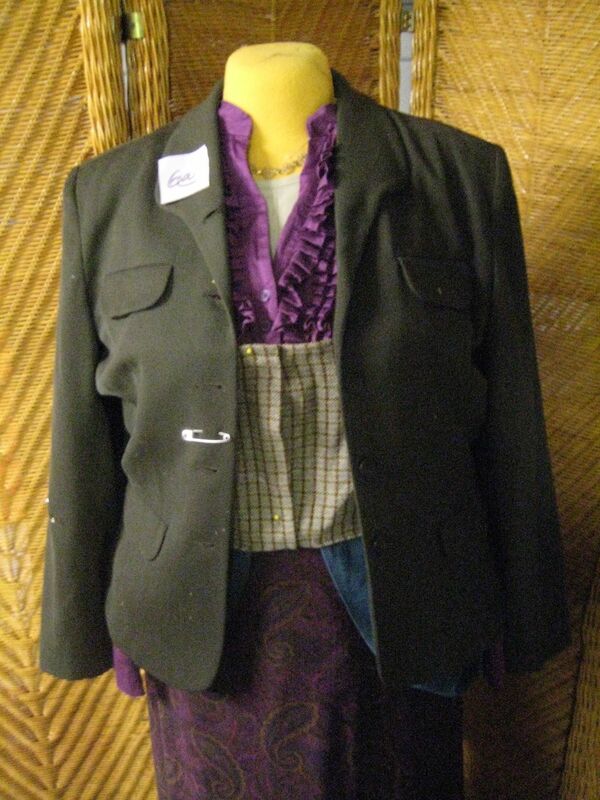 The jacket, before alteration. I bought because it's long enough to turn into a fanciful mini-tail coat. I've sort of free-handed a new bottom line for the jacket. 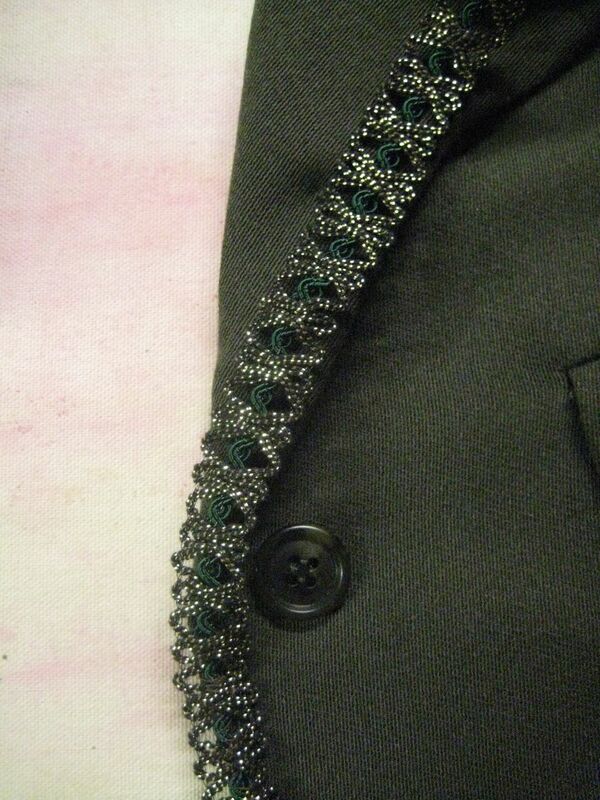 When I had the actress try on the jacket, I placed a pin at the center front where I wanted it to hit her. 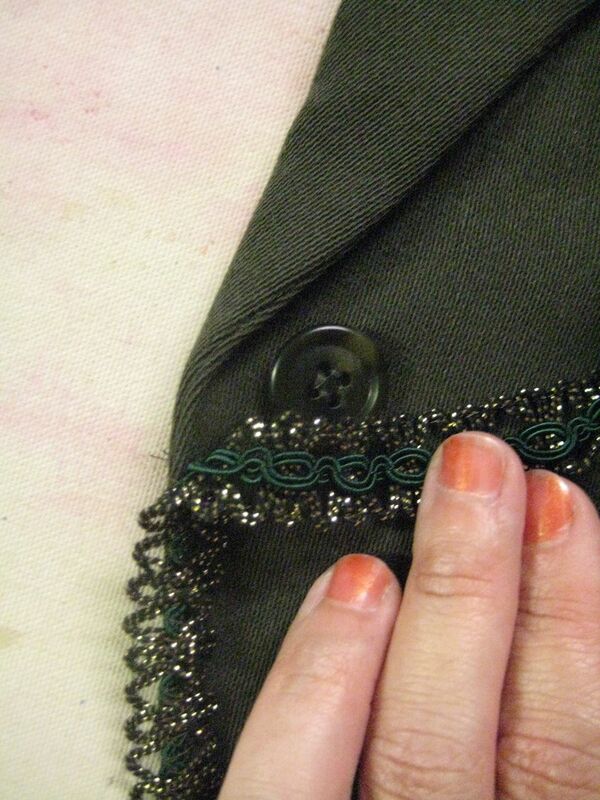 Per my usual practice, I'm using the bit I cut off one side of the jacket to mark the other side. For me, this is faster and more accurate than trying to actually measure it. Because of all the curves, I decided to just zig-zag the edges to seal them. 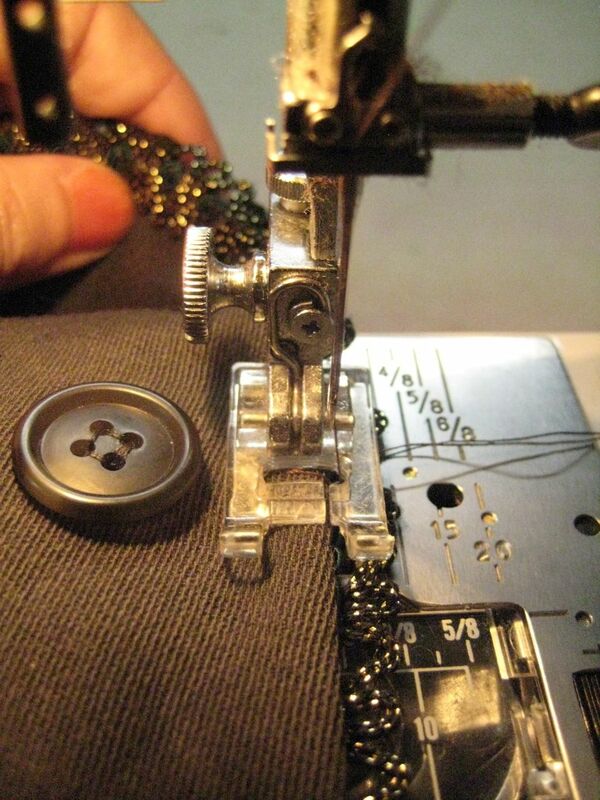 This is a million times faster and easier than dealing with seam allowances. 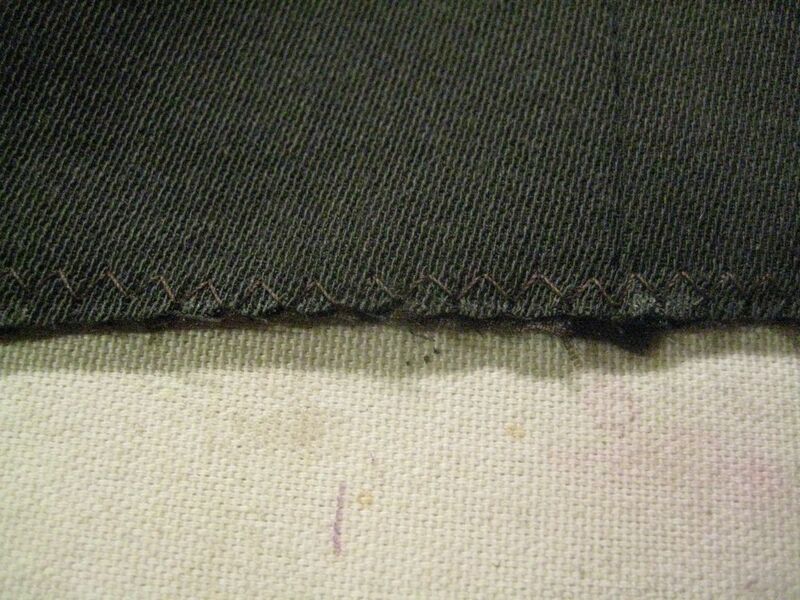 So, I just want to smack a little line of trim around the edge of the jacket. What could possibly go wrong with this plan? 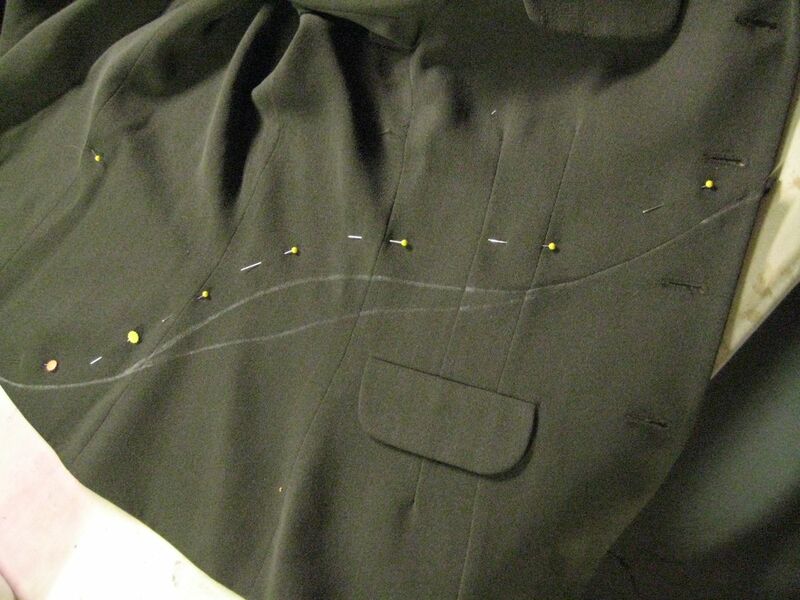 So whatchyer' gonna do is sew your trim on the outside of the jacket right up to the point where the lapel turns back. Backtack and clip your threads. 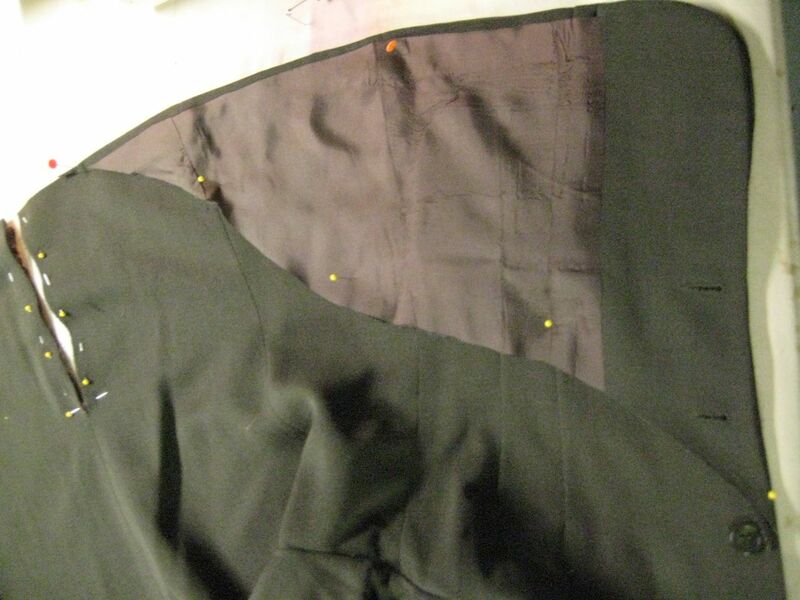 Flip the coat, wrap the trim around the edge of the lapel, and sew from the back side of the lapel. When you get to the other side of the collar, you'll backtack and reverse the process to get back onto the top side of the coat. I also made her a festive little hat. ;) Special thanks to Margie Gustafson for allowing me to use her picture. Skill level: Pretty dang easy. Very Creative! The hat really pulled it all together, ant the end result was ideal. Awww…. Thank you! I’ve always believed in the power of a good hat!